It's the start of a new year, which here at To The Escape Hatch means only one thing, an Escape-athon! That means we're spending the next few weeks looking at escapist movies, from the realms of fantasy and sci-fi, and I'm kicking things off with one of my favourite fantasy films, The Princess Bride. Regular readers should be very familiar with this film, given that it's received two FSF celebrations before, looking at the climactic fight between Inigo and Rugen and text the wedding scene, included in a compilation post, but today it's all about one of the most famous scenes of the film, the battle at the top of the Cliffs of Insanity. The Dread Pirate Roberts, who is really a farm boy named Westley (Cary Elwes), is on the trail of Buttercup (Robin Wright), his childhood love and the intended wife of Prince Humperdinck (Chris Sarandon). 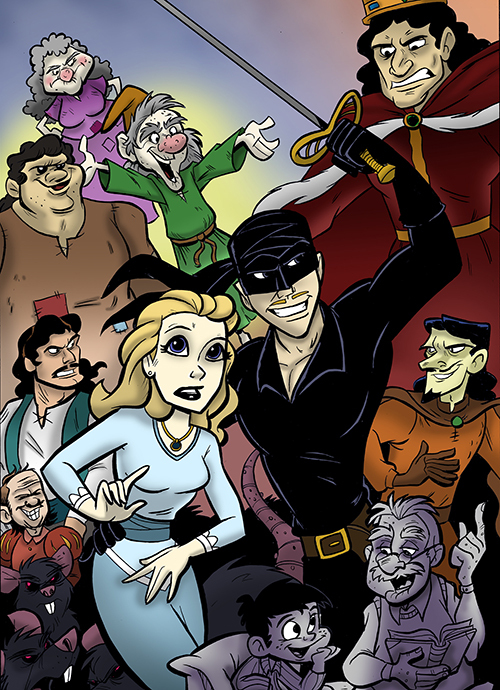 Buttercup has been kidnapped by a trio of apparent criminals (Wallace Shawn, Andre the Giant and Mandy Patinkin), and Westley must defeat each of them to save his love, and the first of these three he encounters is Patinkin's master swordsman Inigo Montoya, who is himself upon a quest of vengeance against a fabled six-fingered man who murdered Inigo's father. The two fight and Westley eventually bests Inigo and continues on his way, but not before one of the most entertaining sword fights ever committed to celluloid. In fact, the fun of the scene starts long before the blades are even drawn. Westley must first reach Inigo at the top of the cliffs and Inigo, who is impatient for his chance to further practise his skills in preparation for eventually encountering the six-fingered man, is willing to help Westley up with the use of a rope, but Westley is understandably cautious of this assistance from a man whose primary intention within the scene is to kill him. I adore the comedic nature of the very premise of the scene, how these two men so intent on battling one another to the death can still respect and admire the skill of the other at combat, and the blase attitude they seem to have to the whole affair, even mid-fight. There's so much emphasis on sportsmanship and fair play to make it almost ludicrous. The scene allows for some natural exposition - in the break Westley is given to catch his breath after climbing the rope, Inigo provides his tragic back story, immediately empathising us with his character - and the dialogue within the scene is so quotable, as it is with almost the entire film. Plus, everything Inigo says is made ten times more fun by virtue of Patinkin's impossibly thick accent. Imagine Beauty and the Beast's Lumiere, but is he was Hispanic. It's wonderful. The choreography of the combat gets more than a little goofy, especially once the gymnastics and sword-throwing come into play, but vitally it never gets boring, it's always fun to behold, and I always want it to last far longer than it does..
Do you have a favorite fantasy fight scene? This is a fantastic scene from a fantastic movie. I agree about the fun starting before the fight. I love Inigo's promise to Wesley and the latter's immediate acceptance of it. You're right about the choreography and even the music is pretty cheesy. I think Honest Trailers just called them out for that. Cary Elwes is going to be in town in March I think, specifically to talk about this movie and I think his book about the making of. Should I go? I love the film, but I wouldn't go mainly because I don't really go in for the whole "behind the scenes" talks things, but also because really, who has the time? I can't imagine anything Elwes has to say making me love the film any more than I currently do.